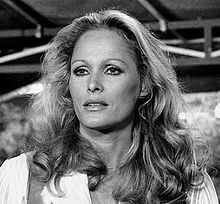 Ursula Andress (born 19 March 1936) is a Swiss television and movie actress who played the Bond girls in Dr. No and Casino Royale. She also starred in many other movies besides that. Andress was born in Ostermundigen to a Swiss mother and German father. This page was last changed on 16 July 2017, at 20:39.